Hobbyists and nature enthusiasts will love this handsome, large format volume. Virtually every two-page spread presents approximately fifteen to twenty striking, full-color photos, all captioned with scientifically correct summary information and designed to serve as identification aids to hobbyists and collectors. An extensive index and a helpful glossary help readers find their way quickly and easily through a multitude of details. Mineral formations as common as iron and sulfur and as precious as diamonds and rubies are shown as they occur both in natural deposits and in their refined and cut-and-polished states. Readers get an overview of mineral sources, gem cutting, imitation gems, metals and metal working, and much more. Also described and shown are meteorites that have fallen to earth from outer space. Perhaps most fascinating of all are the many color photographs of fossils, including insects, shellfish, vegetable forms and animal skeletons, preserved in fossilized formations for millions of years. Hard cover, 9" x 12", 127 pages. The unique properties of amber (fossilized tree resin) have long intrigued many people and never more so than now, in the wake of Michael Chriton's fictional Jurassic Park and real scientific breakthroughs in achieving what Chriton theorized: the cloning of an ancient DNA sequence of amber. 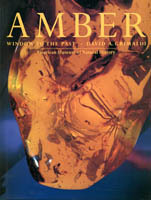 Originally published to accompany the hugely popular 1996 exhibition organized by the American Museum of Natural History in New York, Amber: Window to the Past explores thoroughly the various aspects of this remarkable material, from its part in delineating evolutionary history, through the study of folklore surrounding it, to is use in decorative arts and jewelry. The 230 gorgeous and amazingly varied photographs and drawings, 115 in color and never before published, vividly illuminate the roles of amber in both nature and art. This engrossing and readable book will delight lovers of science, history and art as well as anyone intrigued by stories of how we and our world have evolved. Soft cover, 9" x 11", 216 pages. The National Audubon Society Field Guide to North American Fossils is the first all-photographic field guide to the fossils of North America. Each of the 474 identification pictures is a full-color photograph of a fossil. Sponges, corals, trilobites, shells, teeth, bones and many other types are represented. Also included are 33 color photographs of fossil-bearing rocks and outcrop formations, plus 15 maps. The first guide to be organized visually with a key. Arrangement by shape and color makes identification quick and easy. More than 700 fossils are covered, 420 of them in full detail. Highly recommended. Soft cover, 4" x 7.5", 846 pages. The National Audubon Society Field Guide to Rocks and Minerals is the first all-photographic field guide to the rocks and minerals of North America. 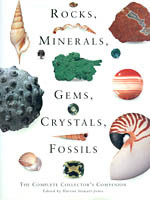 It features 794 full-color images of all the important rocks, gems, and minerals of North America, showing their many variations of color and crystal forms. The text provides descriptions of 200 minerals (including 20 classified as gemstones) and 40 rocks, as well as descriptions of the natural environments where they occur. Highly recommended. Soft cover, 4" x 7.5", 849 pages. An Instant Guide to Rocks & Minerals is an ideal compact identification guide to the rocks, minerals, and crystals found on the shore, in the desert, in national parks, on old mine tips, in yards and in the stone and stone-faced buildings of North America. this user-friendly guide assumes no previous knowledge: an easy-to-follow system of color-coded bands and symbols designating type of rock and hardness of mineral leads quickly to the correct section of the book. Detailed full-color illustrations and a concise but informative text that includes details of principal U.S. locations allow you to identify accurately the most familiar rocks and minerals of North America. Hard cover, 4" x 7", 125 pages. This handy identification guide offers a superb collection of photographs and compacts a wealth of information in a unique way that is useful to both experienced collectors and beginners alike. The 156 specimens are shown in individual color photographs and ordered by their overall color which is shown on the page corners for quick reference. Pictographic tables use easily identified symbols to allow instant selection from a mass of detailed information the characteristics and properties which can be used to identify and classify each mineral - including its geometrical structure, and reaction to physical and chemical tests. The key to the symbols is printed on a bookmark for easy reference alongside each page. Before the main field guide there is a useful introduction on how to recognize and collect minerals, their origin and formation, structure and properties, their classification, and how to prepare them for preservation. There is also a full explanation of the tests which may be used to help identify specimens using only a few simple pieces of equipment, and a summary of more advanced laboratory techniques. A glossary, bibliography and indexes complete the work to make it both a practical handbook and condensed reference manual. Soft cover, 5" x 8", 215 pages. Learn how to identify and classify different rocks, unearth clues leading you to mineral deposits, and perform exciting experiments with your own collection. Beautiful color photographs of both museum quality stones and everyday rocks encountered by amateurs will make every collector want to own this ultimate field guide. First learn about the Earth and the stages of its physical development. Explore the fiery birth of igneous rocks and see how to distinguish them. Unearth clues to identifying sedimentary rocks, made by eons of weathering and abrasion. Delight in the magic of metamorphic rock formation - rocks that have been fundamentally changed by heat, pressure and fluid. Just like a detective, you'll learn how to gather facts about rocks to ascertain what type and classification they are. Take the first step in discovering the origin of a specimen by observing its color, texture, weight, size and features. If you're still stumped, find out how to perform your own tests to determine hardness on the Moh's scale, density, tenacity, magnetism, chemical properties, heat and electrical conductivity, and radioactivity. Put all the results together and you should be able to unravel the mystery. This is the only book you'll need to begin the fascinating hobby of mineral collecting. You'll want it in your pack when you explore, and at home when you're examining and identifying your finds. There are hours of fun to be had and worlds to explore, literally, right under your own two feet! Hard cover, 6.5" x 9.5", 192 pages. Robert Haag has transformed the way the world looks at meteorites. His adventures have taken him from the Atacama Desert to Timbuktu in search of treasure from space, and his legendary collecting activites have even sometimes landed him in hot water with local authorites. His meteorite collection is regarded as one of the top 10 most important and valuable treasures on Earth. Featured in this photographically oriented work are spectacular specimens of octahedrites and hexahedrites, ataxites, silicated irons, pallasites, mesosiderites, shergottites and nakhlites, achondrites, aubrites, diogenites, howardites, eucrites, estatite chondrites, carbonaceous chondrites, ordinary chondrites and tektites. This book belongs in the library of any meteorite collector or anyone just wanting to learn more about rocks from space. Soft cover, 7" x 10", 126 pages. Rocks & Minerals is divided into three main sections. "Realm of Rocks" provides background information to help collectors acquire a strong base of knowledge - including an overview of geology and discussions on the earth's crust, rock composition, plate tectonics, and volcanoes. "Mineral Kingdom" explains the structure and composition of minerals, explores the technology involved in underground and ocean mining, and describes the fine art of cutting gemstones. "Collector's Wisdom" contains practical advice for the hobbyist on acquiring the tools needed to gather specimens, classifying and testing samples, and finding the best rock and mineral sources. Identification guides detail information on origin, chemical composition, and such identifying characteristics as color, streak, luster, hardness and specific gravity for more than 150 rocks and minerals. Rocks & Minerals incorporate's Discovery Channel's unique authoritative approach and acclaimed visuals, going beyond traditional field guides by combining field identification techniques with fascinating background information and practical hands-on advice. Rocks & Minerals is sure to delight, teach and entertain rock and mineral enthusiasts, and reveal our wondrous world as never before. Soft cover, 5" x 8", 192 pages. This definitive guide to rocks and minerals includes 385 color photographs showing rocks, minerals and geologic formations. Hundreds of minerals are descrived, with details such as geologic distribution, physical properties, chemical composition and crystalline structures. Rocks and Minerals is organized in two major parts. Part 1, An Introduction to the Study of Rocks and Minerals, contains chapters on: Your Mineral Collection, Rocks and Minerals and Where to Find Them, Physical Properites of Minerals, Crystal Classifications, The Chemical Classification of Minerals, and Tests, Techniques and Tips. Part 2, Mineral Descriptions, covers: Elements, Sulfides and Sulfosalts, Oxides, Halides, Carbonates, Nitrates, Borates, Sulfates, Phosphates, Arsenates, Vanadates, Uranates, Tungstates, Molybdates, and Silicates, which are further categorized and described as Silica, Disilicate, Metasilicate, Pyrosilicate, Orthosilicate, and Subsilcate types. No collector's or rockhound's library is complete without a copy of Frederck H. Pough's Rocks and Minerals. Highly recommended. Soft cover, 4.5" x 7", 396 pages. The Peterson First Guide to Rocks and Minerals features beautiful color photographs and concise description of more than 250 rocks and minerals most interesting to collectors, simple accounts of how and where igneous, sedimentary and metamorphic rocks are formed, and information for the beginner on how to identify rocks and minerals and where to find the best specimens. Soft cover, 3.5" x 7", 128 pages. Covering Rocks and Minerals from around the world - from brilliant Brazilian Aquamarine to Wulfenite from Arizona's Red Cloud Mine - this unique guide was created for the serious mineral enthusiast or rock collector. This Golden Field Guide from St. Martin's Press fills the gap between academic texts and popular books by providing a magnificent rock and mineral catalog in glowing color, plus tips on where they are found. Hundreds of illustrations of rocks and minerals, molecular structure and idealized crystals also pictured, classification follows the system preferred by experts, includes hardness, crystallization, chemical properties and superb background information. Soft cover, 4.5" x 7.5", 280 pages. How can Platinum help reduce pollution? What makes rubies red and sapphires blue? Why is graphite used to make pencils? The answer to these questions and many more are packed within the pages of Rocks and Minerals Pockets Full of Knowledge. Systematically organized for easy access to information. Covers rock types and minerals, provides many facts related to scientific properties and identification as well as historic and commercial uses for rocks and minerals. This book belongs in every student's and rock pup's library. Soft cover, 4" x 5", 160 pages. This popular non-technical introduction to meteorites, asteroids, comets, and impact craters is now even better! With more than 50 new photographs and illustrations, updated and revised text, and fun cosmic humor, Rocks from Space probes the latest astronomical discoveries. Watch Sojourner bump its way across Mars. Sneak another look at Comet Hale-Bopp streaking through the dark sky. View photos of the impact scar - twice the size of Earth - where Comet Shoemaker/Levy collided with Jupiter. And learn the latest meteorite chemistry and classification. Chapters include Shooting Stars, Meteorite Showers, and Fireballs, Rocks from Space? Impossible!, Effects of a Falling Meteorite, Tracking Fallen Meteorites, Meteorite Showers, Two Great Siberian Meteorite Falls, America's Great Meteorite Crater, Earth is a Cratered World, How to Recognize a Meteorite, Chondrites - The Common Stony Meteorites, Achondrites - The Crust of Planets, Iron Meteorites - The Cores of Planets, Stony-Iron Meteorites - the Mantles of Planets, The Great Meteorites - Their Discovery and Recovery, Harvey Harlow Nininger, Meteorite Hunter, Robert A. Haag, the "Meteorite Man", Hunting for Meteorites, Asteroids - "Parents" of the Meteorites, Searching for Meteorites' Lost "Parents" and When Worlds Collide. Highly Recommended. Soft cover, 6" x 9", 447 pages. This comprehensive collector's companion brings together, in one book, four elements that are found everywhere on the Earth's surface. Fully illustrated with over 400 superb color photographs, it is packed with information about the fascinating world of rocks, minerals, shells and fossils. Rocks, Minerals, Gems, Crystals, Fossils has four major sections, each featuring identification profiles that provide an instant source of reference and classification of the most important varieties. Each entry is accompanied by a color photograph, scientific name, succinct and detailed description, origin and a panel of symbols that present key properties at a glance. For collectors, the book provides a simple key t5o identifying specimens that may be found on a geological foray, an archeological dig or even a stroll along the shore. Rocks, Minerals, Gems, Crystals, Fossils is a sure to be appreciated reference for both observers and collectors. Hard cover, 9" x 11.5", 160 pages. Practical, concise and easy to use, Simon and Schuster's Guide to Rocks and Minerals contains everything that the rock and mineral enthusiast needs to know. This field guide is divided into two large sections - one devoted to minerals and one to rocks, each prefaced by a comprehensive introduction that discusses formation, chemistry and more. All 377 entries, beautifully illustrated with color photographs and helpful visual symbols, provide descriptions and practical information about appearance, classification, rarity, crystal formation, mode of occurrence, gravity of mineral, rock chemistry, modal classification fields, formational environments, grain sizes of rocks and much more. Whether you are a serious collector or an information seeking amateur, this incomparably beautiful, authoritative guide will prove and invaluable reference. 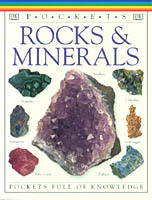 If you could only have one guide to rocks and minerals in your library, this would be the one! Highly recommended. Soft cover, 4.5" x 7.5", 607 pages. A practical guide for collectors, this unique volume offers advice on where to find stones as well as information on how they are formed and how they can be used. It answers such perennial questions as: Why are some stones black, others white, others red and still others different colors or combinations of colors? Why are some smooth and others rough, some nearly round and others all sorts of shapes? Designed for easy reference, Stones takes a simple, scientifically sound approach, offering hand identification tables for commonly found minerals and rocks and informal yet accurate pen-and-ink sketches. An extensive glossary and list of suggested readings are also included, helping to make this volume a self-contained primer for the student or amateur collector. Soft cover, 4" x 7", 191 pages. Turquoise. What other gemstone comes in such an astonishing variety of colors and forms, or is more evocative of the American Southwest? Turquoise Unearthed showcases exquisite examples of rough and polished natural turquoise from more than twenty famous and classic mines including Lander Blue, Number 8, Bisbee and Lone Mountain. Appealing to rockhounds and serious collectors alike, Turquoise Unearthed is a definitive, contemporary visual guide. Here too are spectacular works by modern jewelers, along with fascinating ancient and historic Native American turquoise jewelry and ceremonial objects. Soft cover, 6" x 9", 74 pages.